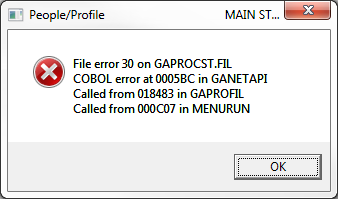 From time to time you will experience Cobol file errors. These are caused by a variety of reasons, and should always be reported to Execu/Tech support, even if you don't have a support contract. They may be insignificant, or they may be a symptom of a larger issue, like failing computers or network equipment. Usually, if the error is permanent, and not caused intermittent hardware or network issues, your software will stop working or have limited functionality. If this is the case, Execu/Tech support can usually recover the file if it's a matter of simple data corruption. The following error is an example of what you might expect to see. While this error means that the file was not able to open, the actual cause is data corruption. A simple rebuild of the file will usually fix this problem and takes just a few seconds to preform. A CLOSE UNIT/REEL statement was executed for a file on a non-reel medium. The operation was successful. The operation was successful, but some optional feature was not used. For example, if you opened a file that specified an alternate collating sequence, but the host file system did not support that feature, then the open would succeed, but it would return this status. This error is usually caused by two or more terminals editing the same record at the same time. This can happen when warnings are overridden or if functions in the Night Audit are performed while users are still logged in and editing records. Call support for assistance. The hard drive containing the Execu/Tech software database is full. Contact your IT immediately! 30, 3000 Permanent error. This is any error not otherwise described. This error, and the error below, are often associated with Point of Sale printing. $windows will sometimes be seen in the error because we use this internal designation for the Windows print spooler. This is usually caused by a failure of your print spooler, changing printer names or removal of printers. The software is looking for a specific printer and Windows can't find it. Try rebooting. If rebooting doesn't fix the problem, contact your IT to troubleshoot. It can also be caused by hard drive or network failure if the error is related to a file. Try rebooting. If the errors occur often, please have an IT professional look at your entire system, including the server, clients, network infrastructure, etc. Permanent error. This is any error not otherwise described. The secondary code value is set to the host system's status value that caused the error. See your operating system user manual for an explanation. These errors can be caused by hard drive or network failure if the error is related to a file. Try rebooting. If the errors occur often, please have an IT professional look at your entire system, including the server, clients, network infrastructure, etc. Attempt to open a sequential file with fixed-length records as a Windows spool file. A Windows or Windows NT runtime that is not network-enabled tried to access a file on a remote machine. The list continues in this manner for each alternate key. The file may be open by another terminal or a Remote Desktop session that didn't fully disconnect. You can use Computer Management to check this and release the file or, if using Remote Desktop, disconnect any idle sessions you suspect of causing the problem. As a last resort, you can reboot the server. Try rebooting your workstation and running the process again. If this does not work, you may need to run a GANXREF. Please contact Support for specific instructions on completing this step. Sometimes this is related to printing. If it is, it's because Windows can't find the printer or it fails to respond. Try rebooting. Contact your IT professional to troubleshoot. The server has locked the file specified and your user can't access it. You typically only see this error when a computer locks up or there is a break in network communication during a read or write process. Try rebooting your computer. If that doesn't work, reboot the server as well. If you need assistance with the instructions provided by Microsoft, contact your qualified IT professional. You may also consider rebooting first to see if that fixes the problem. Indexed file corrupt. An internal error has been detected in the indexed file. The secondary status code contains the internal error number. The file should be reconstructed with the appropriate utility. Record locked by another user. This is different that file error 93, because the file itself isn't locked, just a single record within that file. It's common to see this error temporarily flash then go away. Sometimes, the error will remain, and if it does, you should check for a couple things. Perhaps someone is running a report that takes a while to complete. During this time, some files might be locked. It's also possible that someone is editing setup records, like Rooms, Payment Codes, Point of Sale Store Record, Items or Categories, etc. If someone were to leave their terminal while in the middle of editing, for example, the Store Record, you might see file error 99 when selling items, running reports or closing the day. If this happens you can try to find the offending terminal or you can restart the server. If you are using AcuXML, this error results when the program tries to open a file EXTEND or I-O. With AcuXML, programs are able to open files INPUT or OUTPUT only. 02 - In Acu4GL or AcuXML, 9D,02 indicates that an XFD file is corrupt. This could be the result of a parsing error. 03 - In Acu4GL or AcuXML, 9D,03 indicates that an XFD file is missing. This could be the result of a parsing error. 5 - In AcuXML, 9D,05 indicates that there was an XFD parsing error, so AcuXML was unable to read a record. Refer to the specific Acucorp product documentation for more details on the host file system's error codes. This indicates an error occurred in the transaction system. The exact nature of the error is shown by the contents of TRANSACTION-STATUS. See section E.4, "Transaction Error Codes." This indicates that you are executing the program with a runtime that has a restriction on the number of records it can process. You have exceeded the record limit. This error has two common causes. The Windows operating system doesn't have enough memory to load and run the program. Have your IT professional check out your computer. Maybe you're running too many programs, maybe you need to restart the computer or maybe you need more RAM. The program loaded into memory but was corrupted. If every user gets this error on the same program, contact Execu/Tech support and we'll help your IT professional restore it from your backup. If you use Execu/Vault then we'll restore it for you. If the problem is intermittent or you're the only user having this problem, then you likely have a hardware problem. It could be a poor network connection, failing RAM or CPU or any other hardware problem that would cause the program to be corrupted as it's read into memory. Your IT professional should check out your computer for you.